With the price of fuel rising by the day, everyone is looking to reduce their consumption of gasoline. One question that we get all the time is how to use magnets on an automobile fuel line to improve gas mileage. There are many manufacturers out there selling "specialized" devices with "monopole" (yeah, right) magnets, magnets that are specially "tuned" (again, yeah, right) or other glorified claims that make their product special. Well, we're here to tell you that these glorified claims are untrue. First off, there is no such thing as a monopole magnet. They just can't exist according to the laws of physics. As for "tuning" magnets, there really isn't anything to "tune", unless you call putting a pair of identical magnets together "tuning". A permanent magnetic field is not moving, does not have a frequency, nor is it making any noise, so there is really nothing to tune. 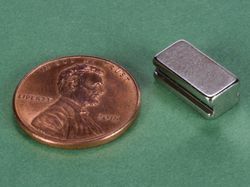 Basically, every one of these magnetic fuel saving devices is a magnet, a pair of magnets, or several magnets arranged in various configurations. The most common is a pair of magnets in a housing that clamps around the fuel line, with the magnets in attracting arrangement, meaning opposite poles of the magnets are facing each other so the magnets want to come together. This configuration creates the strongest magnetic field possible through the fuel. While we make no scientific claims about their use, several of us have tried this on various vehicles with varying degrees of "success". On 4 of the 6 vehicles tested, the regular driver noted improved fuel mileage by 1/2 to 2 miles per gallon. Two of these say that it took about 2 months to notice improvement, which is a claim made by other manufacturers. In two of the vehicles, the driver reported no change in fuel mileage. Conclusive? Hardly. But it does make us believe that there is a possibility that strong magnetic fields may improve fuel mileage. We won't even speculate as to how or why this happens - we'll let all the "specialists" make their claims and tell you why it works. We have been using plain magnets with plastic or wood blocks with wire ties and/or tap to hold them in place. To make things easier, we decided to design and stock our own "magnets for fuel lines" (note the lack of claim of increase in fuel mileage). You can see them here: FuelMag1. 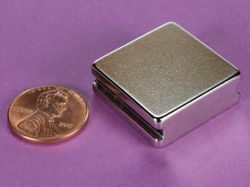 These units are a pair of our strong neodymium magnets mounted in plastic holders. There is a steel backplate behind the magnets to concentrate the magnetic field between the magnets. The assembly is designed to easily mount on most fuel lines simply by placing one on each side of the line and fastening with the included wire tie. This assembly create a strong, 7000 Gauss, magnetic field between the magnets. Others instruct you to install the magnets as close to the engine as possible. This seems to make sense, so we recommend it as well. We are not mechanics and do not claim to know much, if anything about automobiles, so please don't ask us for specific instructions for installing magnets on your car. All we can tell you is "on the fuel line as close to the engine as possible". We have seen some of the "fuel extender" devices go for $60 to as much as $200 per unit. That's a lot for a pair of magnets in a plastic housing. We offer ours for much less. If they improve your fuel mileage by even a little bit, it won't take long for the magnets to pay for themselves. We do not make any claims or guarantees to the effectiveness of the magnets increasing your fuel mileage, but we welcome you to try it and welcome any feedback you have about your experience. If we get enough feedback, perhaps we'll start a tally of our own "scientific" findings.